This style of tea is the most common jasmine tea worldwide. Jasmine scented tea is tea that has been infused with jasmine flowers several times during tea production. While the flowers are removed, the wonderful aroma and delicate taste remains. This style of scented tea is the most common jasmine tea worldwide. Jasmine scented tea is green tea that has been infused with jasmine flowers several times during tea production. While the flowers are removed, the wonderful aroma and delicate taste remains. Although most jasmine tea producers use commercial green tea, White Cloud Jasmine blends gently shaped tea buds with very fresh young leaves infused at least three times with fresh jasmine flowers. Cheap, commercial scented teas, are often times sprayed with jasmine-scented chemicals. It is easy to spot a cheaply made, commercial jasmine tea because after only one infusion, the jasmine aroma will be completely lost. Since our scented teas are infused with fresh jasmine flowers multiple times, the jasmine aroma will last with you until the very infusion. The taste of White Cloud Jasmine is rich, but not too perfumy. It carries the rich aroma and scent of jasmine without overpowering you with flavor. 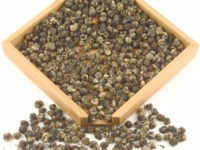 The downy white appearance of the Sichuan tea buds gives this tea its name and rich robust flavor. It is important to note that scented tea and flavored teas are often used synonymously but are in fact very different types of teas. Flavored teas are often blended with berries, nuts and other herbs and typically artificially flavored with various flavors (raspberry, chocolate, cake, etc). A good quality scented tea is made up of ALL tea leaves and are never cut with freeze dried fruit and flavorings. At Seven Cups, we don’t carry any flavored teas. Mixing fresh jasmine flowers with green tea and scent overnight. The jasmine covered green tea is left out in the open overnight. After mixing jasmine and green, the jasmine flowers must be completely separated from the tea the next day. Tea workers sort jasmine flowers out by hand after the tea has been scented. Re-roasting tea leaves after they have been scented makes the tea very fuzzy. A machine sorts out different grades of white cloud jasmine tea. Infusion: First infusion at least 1 minute. The leaves are good for 6 infusions. Add a little more time for each subsequent infusion.